I've love finding out new stuff about animals. I learn so much writing Wildlife Wednesday posts and I also get introduced to new animals by taking suggestions for the Daily Zoodle, new animals like the Dugong. Dugong was recently a prompt for Daily Zoodle. I'd heard of dugongs before, but I'd always assumed that it was just another word for manatee, or maybe a specific type of manatee. I was wrong! Which brings me to the next 3 weeks of Wildlife Wednesday posts. We're going to talk about Dugongs and Manatees. They have a lot in common, but a lot of differences too. We're going to start by comparing and then spend a week looking at each a bit more closely. Let's get started! Dugongs and manatees are cousins. Both are members of the Sirenia order. They are commonly referred to as sea cows and are thought to be the inspiration behind mermaid stories. There are 4 living species in the order of Sirenia - the dugong, Amazonian manatee, West Indian Manatees and the African Manatee. They are more closely related to elephants than dolphins or whales. Both are considered large sea mammals, but dugongs are usually smaller than manatees. Dugongs and Manatees have almost the same body shape. The most notable difference is their tails. 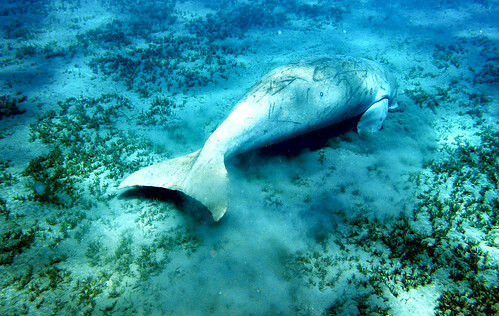 Dugong tails have flukes, similar to a dolphin. Manatees have rounded paddle like tails. Their snouts are also different. Manatees have shorter snouts than dugongs. 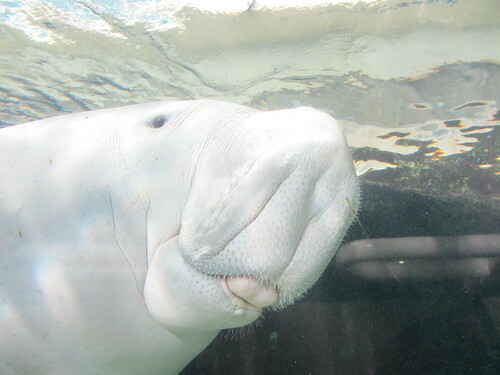 The mouth of the dugong is more angled and downward facing. 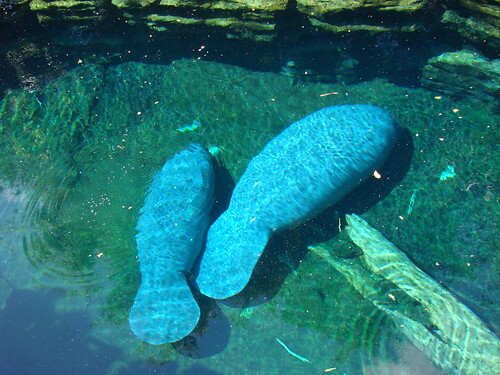 Both can be found in salt water, but manatees move back and forth from salt water to freshwater in the winter. Manatees and dugongs are both plant eating marine mammals. Manatees can eat most sea plants but dugongs only eat sea grass. They can stay underwater for up to 4-6 minutes. They can swim up to 10 miles per hour, but usually stick to a slower pace around 5 miles per hour. Manatees have 6 vertebrate, dugongs have 7. Manatees replace their teeth throughout their life. Dugongs do not. Dugongs have tusks and manatees do not. If you want to learn more about Dugongs and Manatees be sure to visit their Wildlife Wednesday posts.